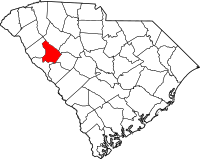 Greenwood County is a county located in the U.S. state of South Carolina. As of the 2010 census, its population was 69,661. Its county seat is Greenwood. This page was last changed on 14 March 2019, at 20:30.